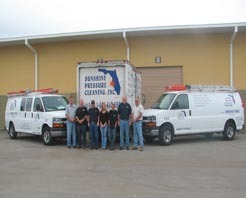 Since 1988 We have provided Kitchen Exhaust Hood Cleaning & Enviromental services to major venues in Orlando, Tampa, Miami, Lakeland, Gainesville & More. We are the fastest growing Kitchen Exhaust Hood Cleaning Company in Florida. We service Large Supermarket Chains, Hotels, McDonalds, Schools, Hospitals, Major Restaurant Chains and More! Our rigorous quality control program provides detailed outlines that our Certified Inspectors & Cleaners follow on each job we do. Were working hard to deliver the absolute highest quality & level of service possible to our customers... And We Can Do The Same For You! Our Certified inspectors perform a detailed photographic inspection. Then we draft an estimate along with a scope of work, detailing our findings. Our report includes any deficiencies we uncover during the course of our inspection and our recommendations to correct the problems. Our focus is on providing comprehensive solutions to our customers. Since our genesis its been about delivering the best service possible and providing peace of mind by completing every job correctly! Call us today our staff is standing by to take your call!